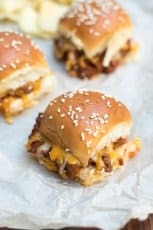 They get even better with a little more time in the fridge. 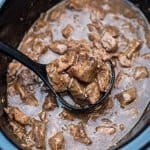 After a couple of days soaking in the flavorful brine, they are zoom-pow, someone help me I can’t stop eating these – good. They make great snacking pickles but they’re also excellent on burgers and sandwiches. You could also make a pretty mean pickle relish with these babies. 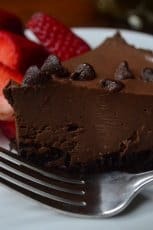 The ingredient list is simple and this particular method is as easy as it gets. “Mom, I made pickles and they are AMAZING!” My response to him, after I recovered from the initial shock? “You’re coming over here to make them with me!” And, so we did. And, here’s how it went. Please focus your attention on Mr Good Lookin’ in the foreground of this photo slicing away at the cucumber. My kitchen was in a shambles on pickle making day. Now that I’ve pointed that fact out, you’re totally staring at my messy kitchen aren’t you? Sheesh. 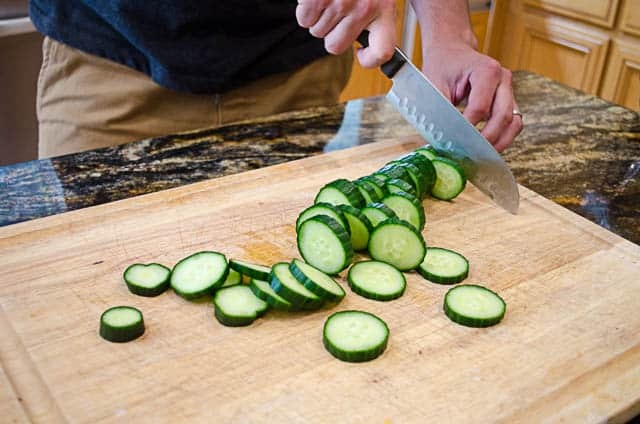 Slice the cucumbers to the thickness you’d like. 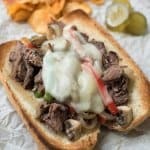 Thicker slices will be crunchier, which we really like and the thinner slices will soften up more, making them great on sandwiches and burgers. You can also slice them lengthwise into spears if that’s more your style. To make the brine, combine 2-1/2 tablespoons kosher salt, 2 tablespoons sugar and 1-1/4 cup unseasoned rice wine vinegar. Mix until sugar and salt are dissolved and vinegar is clear. Then add 2 cups of cold water. Add 2 tablespoons Sriracha to the vinegar mixture and the party has officially started. Grab 3 clean pint size mason jars and divide the seasonings between each jar. 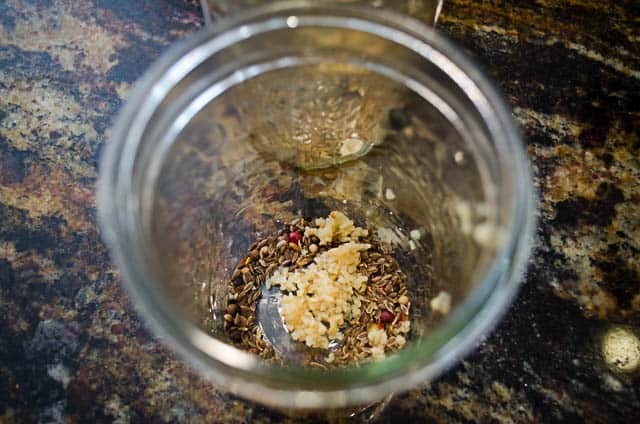 Black peppercorns (I used a peppercorn blend – use what you have or can find at the store), dill seed, minced garlic, and a dash of crushed red pepper. 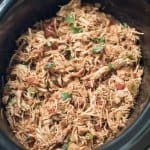 Unless you really like things HOT, don’t be tempted to add more than a dash of crushed red pepper – the stuff is hot but a dash added just the right amount of heat for us. 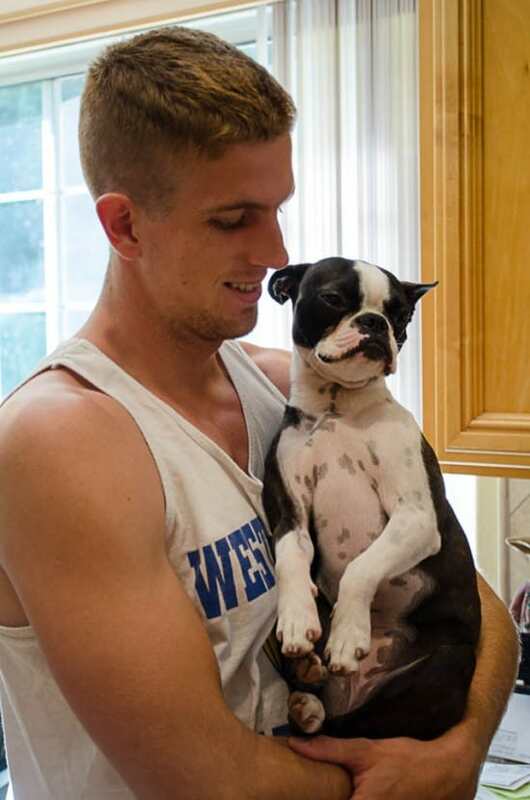 Miss Bridget knew something was going on in the kitchen and she wanted in on it so Boy #4 (aka Adam) lifted her up for a better view. This was just days before we took Adam down to Santa Barbara to set him up in his off-campus apartment in preparation of his second year of college. It was a rare moment where I had my oldest and my youngest in my kitchen at the same time. It was a good day. Time to pack the sliced cucumbers into the mason jars right on top of all those spices. Pour the brine over the top, filling the jars up to the top, leaving only about 1/2″ of head space. Discard any remaining brine. Screw the lids on tightly and get those pickles in the fridge. Let them sit at least 24 hours before eating. They’ll taste even better after 2 or 3 days and will stay fresh for several weeks – if they last that long. Give a jar to a friend and keep a couple for yourself. 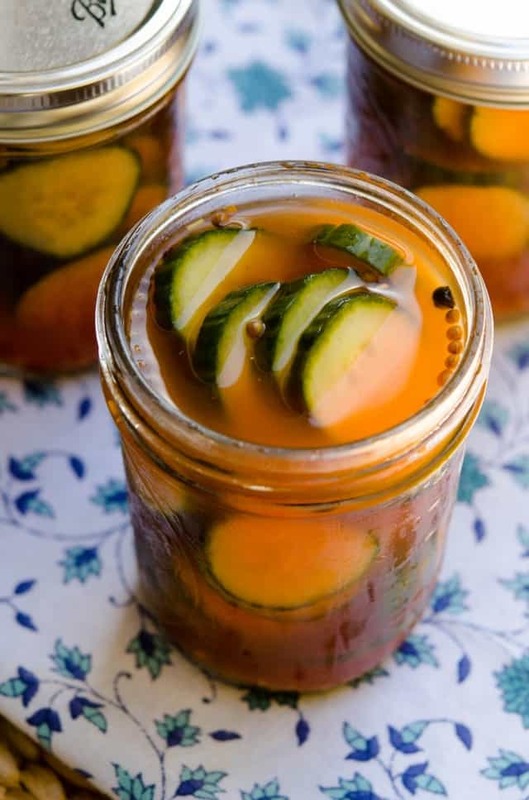 Since we’re smack in the middle of cucumber season, there are lots of great varieties of pickling cucumbers available at produce and farmers’ markets. Kirby and Persian pickles are good choices when available, but regardless of the time of year we can still have our pickles! English “Hothouse” cucumbers are the variety we used here and they are readily available in most grocery stores all year round. Be sure to choose a fresh, firm cucumber that is somewhat uniform in circumference from end to end for the best result. Look for cucumbers that have not been waxed and wash them well before beginning. We used unseasoned rice vinegar in place of the typical distilled white vinegar used in most pickling recipes. Rice vinegar has a milder, slightly sweeter flavor and is also slightly less acidic. 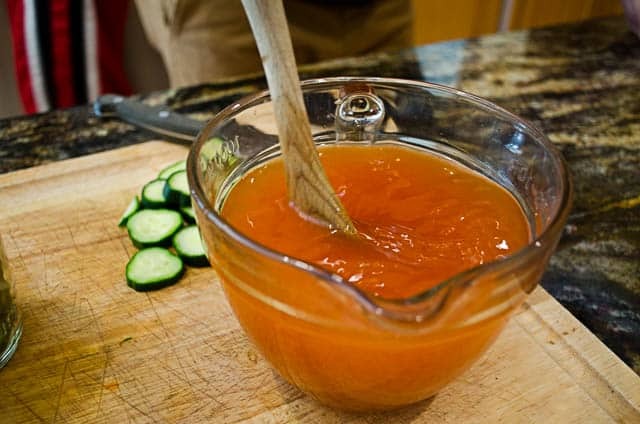 The Sriracha is going to add a nice punch so the milder vinegar works very well in this recipe. Since we’re making refrigerator pickles, the slightly lower level of acidity (4% versus 5% in white distilled vinegar) is not an issue. 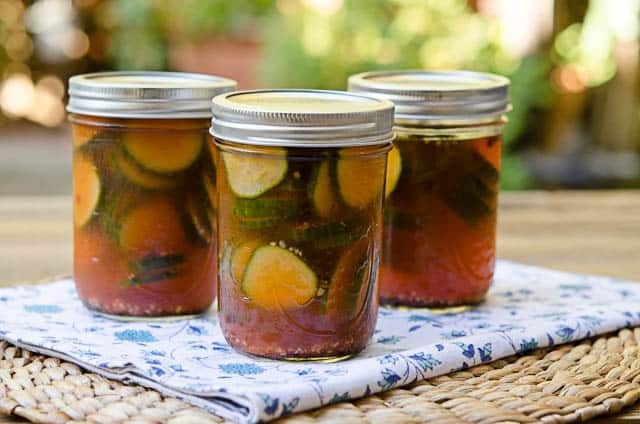 If you plan to preserve your pickles in a water bath canner in order to make them shelf stable, I’d opt for the white distilled vinegar. 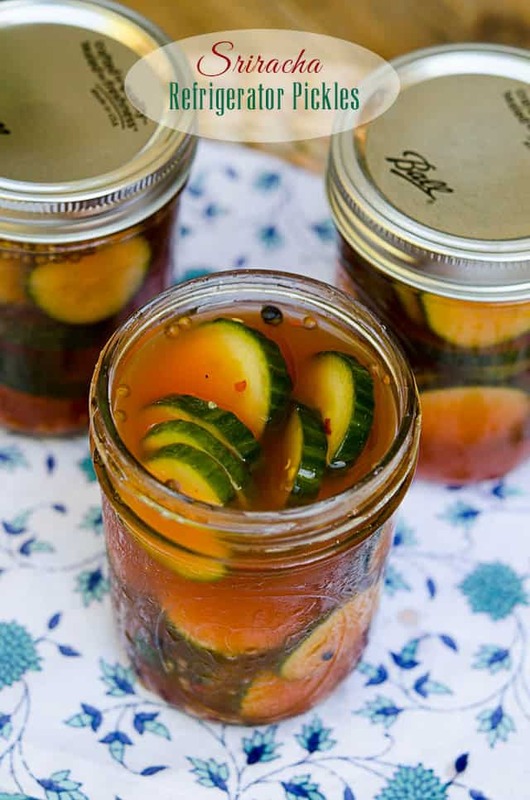 This recipe is meant strictly to be used for refrigerator pickles. Do not be tempted to substitute regular table salt. 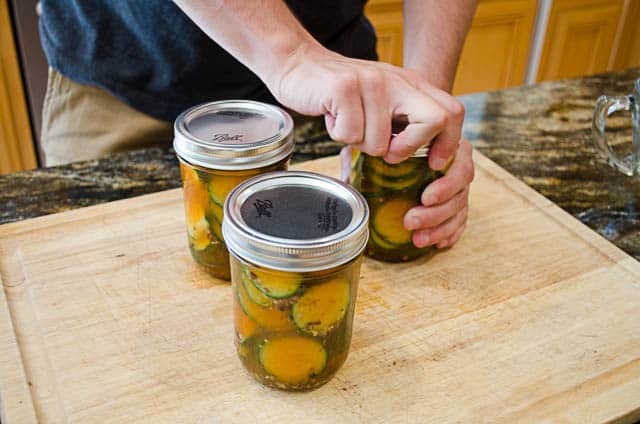 Iodized salt has additives that can affect the color and texture of the pickles and adversely affect the quality of the brine. Stick to kosher salt or salt specifically made for pickling. Prepare the brine by mixing to together the rice wine vinegar, kosher salt, and sugar. Mix with a spoon until sugar has dissolved. Add 2 cups water and 2 tablespoons Sriracha. Set aside. Wash and slice your cucumbers into chips or spears, as desired. Divide the seasonings between 3 clean pint sized mason jars. 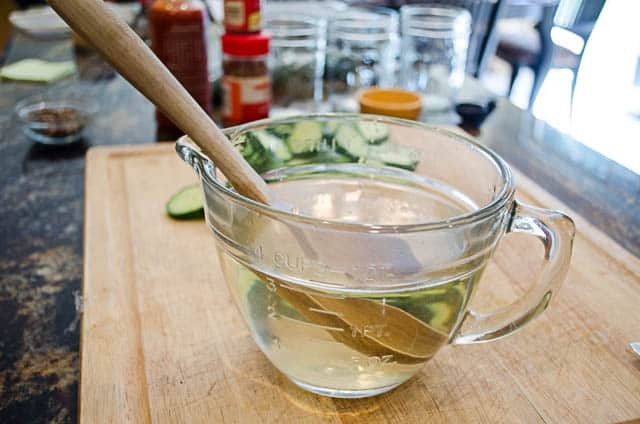 Pack the jars with the sliced cucumbers and then add brine to the top of the jar, leaving about 1/2" of headspace. Tightly secure lids and place jars in the refrigerator. Refrigerate for at least 24 hours or more before eating. 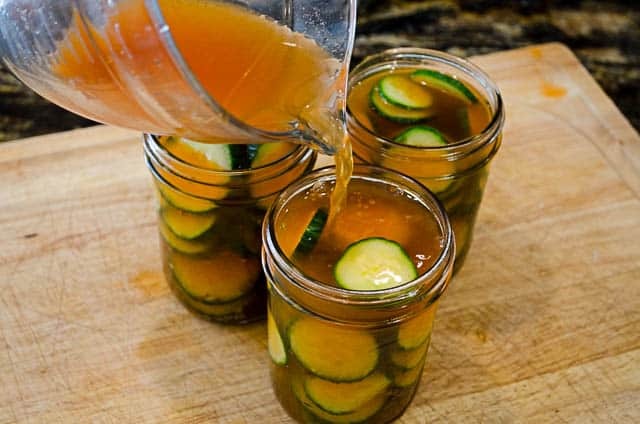 Pickles will stay fresh and delicious for several weeks in the refrigerator. 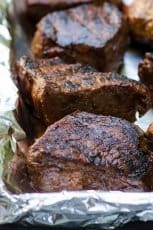 Total time does not include 24 hour marinating time in fridge. 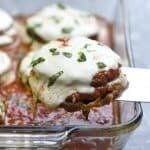 This looks like a fabulous recipe. I’ve been putting sriracha in everything this summer. Love that your young men like to spend time in the kitchen with you. Great times! Val, these sound so amazing and I am making them for Grumpy ASAP. Your son is absolutely dreamy 🙂 and I love hearing those words from my boys also. Chris has called me to tell me or texted me to show me something amazing he has made. We haven’t had a lot of chances to cook together since we are so far apart. 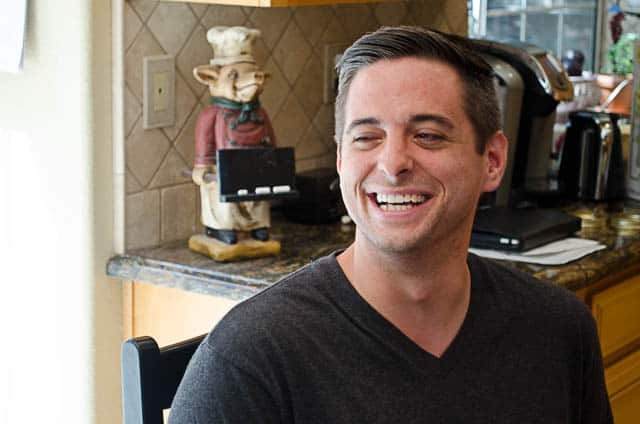 What really surprised me was Justin wanting to bake with me (of course, he had ulterior motives – to eat what we made) but it really is nice to have your boys want to spend time in the kitchen with you. Makes a mom’s heart very happy! Couple of things…first LOVE your new look!! Congrats!! It is so clean and all your gorgeous pics jump off the page. Love it. Also…pickles. So I love pickles and lately have not been happy to purchase them once I discovered some weird ingredients like food dyes and HFCS – what in the world. It’s bummed me out! I have always wanted to make my own and said I would learn this summer, but never did. They seem so easy! I love that your son made these with you — totally made me smile!! And the sriracha addition is genius!! Thanks, Aggie! I’m loving the new look too 🙂 You should totally try making pickles at home. 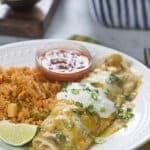 It’s so easy and you’ll love them! I made a batch of refrigerator pickles a couple of weeks ago that are so good. I’ve also made sriracha pickles too…so good. How fun that your son came back and made them with you! Your sons are so handsome! Ok, that is awesome! 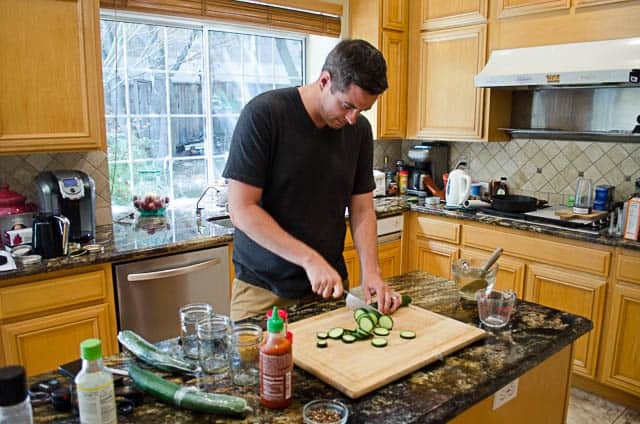 I love refrigerator pickles, but with sriracha and made by your son! Win! What handsome boys you have. 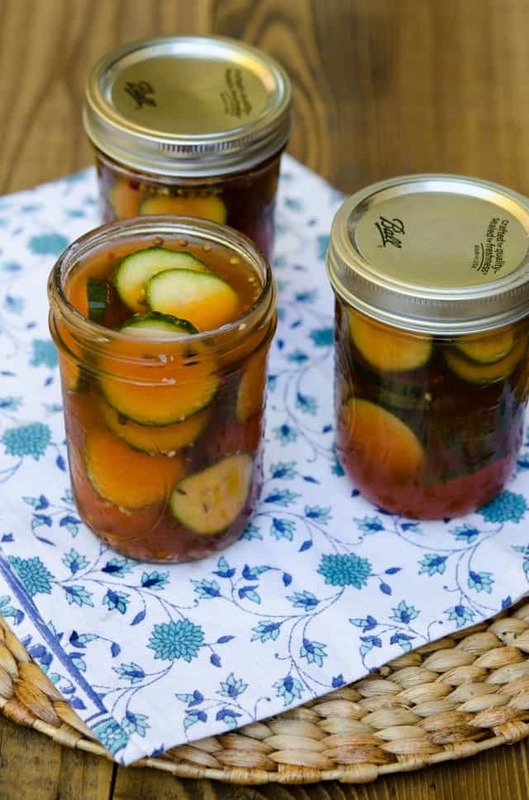 I have NEVER made pickles at home, although I can eat a whole jar at one sitting… this has been on my food bucket list for while. I love the addition of the sriracha! Made mine on Saturday, can’t wait to eat them. I thought the longer they sit, the better they will taste right? I thought they were great after 24 to 48 hours and then several days later they were even better. Enjoy, Sean! I made these this weekend and we love them! I added some extra red pepper flakes because we love “hot”. 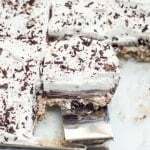 I shared with a friend and they were a big hit with her also. Do you think they would last longer than a few weeks? I know a lot of refrigerator pickles last a few months. Thank you! Hello Beckie! I’m so glad you guys are enjoying them. I do think they will stay fresh and tasty longer but thought it best to state that they would be at their best within that time frame since they tend to soften over time. Thanks for this – they were certainly delicious. Bet that was fun having such great help in the kitchen! 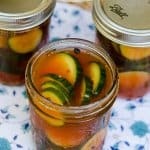 I love this recipe for cucumber pickles! Sriracha AND red chile flakes – these are sizzling!